Steve’s neurosis impatience enthusiasm for the game was a principle motivating factor in my purchase decision. 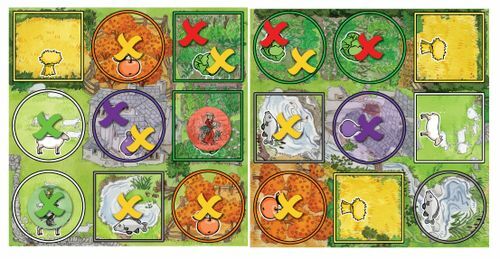 John’s impressive strategy article not only got me thinking more deeply about the game than I might have otherwise, but it also motivated a designer-endorsed (and beneficial) rule adjustment. Bravo. As always, I’d also like to remind readers in advance of my review philosophy: I’m primarily interested in exploring how and why particular game elements produce memorable gaming experiences. Therefore, rules, analysis, opinion, and off-topic rants will be intertwined throughout. It’s not a how-to-play guide, but neither is it a rules-free screed. If you absolutely must skim, you’ve probably already missed this part. In broad strokes, Key Market tells the story of competing families of medieval farmers in the fictional land of Keydom. Over the course of two full years, the families in Key Market harvest crops from Keydom’s communal fields and either sell these goods in the market for scarce and much-needed cash or bribe barter them away in exchange for positions of prominence in Keydom’s powerful and insular network of guilds. True financial success requires masterful planning and nearly superhuman foresight, especially to brave the harsh and unproductive winters. Of course, as the old adage rightly notes, “You don’t need to outrun the bear…”; cutthroat tactics can be a particularly effective means of shoring up holes in your own strategy by ruining the best-laid plans of others. My highest-rated Essen release from 2010, David Brain’s Key Market is a masterpiece of design that simultaneously rewards optimization and ruthlessness, creativity and cunning; that marries limitless variability with precision planning; and that does it all through seemingly effortless mechanics that cohere in their simplicity, with no wasted fiddliness, no play in the joints. Key Market is the sixth stand-alone game in R&D Games’s Key series, and the first such game not designed by R&D founder Richard Breese. 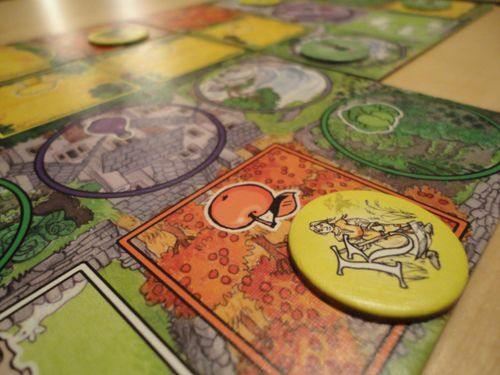 It is undoubtedly the heaviest Key-series game, at least in terms of the weight with which each decision hangs on you at the moment of choice (and indeed lingers with you long after), though playful original artwork by Juliet Breese anchors this difficult game within the existing, colorful Keydom narrative. In some ways, Key Market is an unusual subject for a What You’re Missing review. It was well advertised, much anticipated, and quickly sold out (only 900 copies were produced in the initial run). Under-the-radar it is not. It was also extremely well received, sporting one of the highest average ratings of the 2010 Euro crop (although the sample size is quite small at the moment). But I’ve spent more time thinking about its nuances over the last few months than I’ve likely spent thinking about all the other games I’ve played in that time combined. The designer’s “reasonably intricate” descriptor is more-than-a-minor understatement; the game’s strategic possibilities haunt me. Moreover, the opinions I’ve read are largely incongruous with each other and are never fully representative of my own. I despise the hackneyed platitude that a given game offers “something for everyone,” but it’s clear that Key Market speaks to everyone in decidedly different ways. What you’re missing, then, is what it says when it speaks to me. 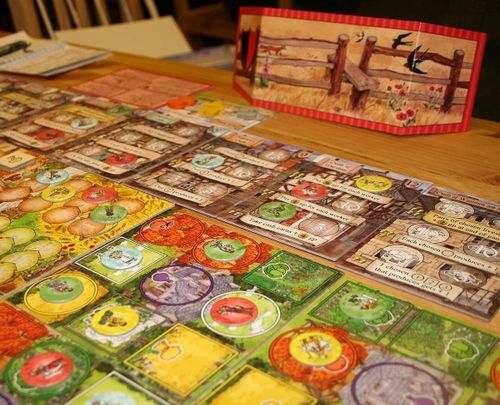 Despite being billed as a medieval farming game, Key Market is very much a game about money. Money is needed to hire, move, and retain family workers in the game’s fields, as well as to occasionally buy goods at the market. But money is also the game’s victory condition, and the heart of Key Market’s gameplay is unquestionably the efficient conversion of resources into cash and cash-equivalents. Key Market is a game that calls upon players to be ruthless in squeezing every cent out of every action on every round; to look beyond the cutesy cabbages and questionably orange apples and see only raw assets, see purchasing power, see investment potential, and see victory. Personally, I find the resulting game anything but intuitive. Especially at first. But I also find that mastering the heavily interdependent systems eventually becomes second nature. The early sessions, full of fitful starts, aborted intentions, and the word “crap” uttered over and over, are a small price to pay for the rich and rewarding experience that soon opens its mysteries to you. It is a game deserving of the difficult mental energy required for success. What follows is a walkthrough of a few of my favorite game aspects. This is a slightly different format than I've used in the past, but it seems more appropriate than a element-by-element discussion, given Key Market's high level of mechanical interdependence. One of Key Market's greatest strengths is the ability to generate substantial replay value through the provision of random elements without subverting the game's strategic focus. 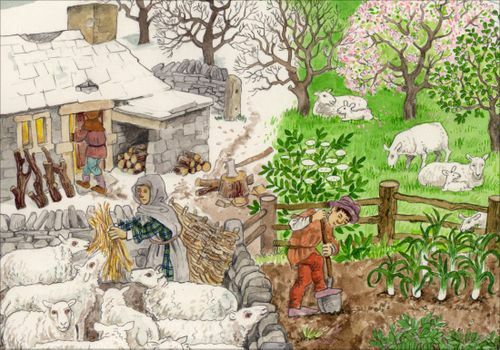 The game's approach to fields and seasons is paradigmatic of this virtue, and so I present it as an example here, but the characteristic pervades much of the game's design. Background. Many of my favorite games incorporate randomness as a way of forcing interplay variety. Typically, however, the consequence of randomization is highly tactical gameplay -- struggling to make the best out of what the game offers from turn to turn. The 2009 erstwhile classic Vasco da Gama (whose meteoric rise was promptly derailed by Tom Vasel's unquenchable thirst for wind his hair) is just such a game. At the other end of the spectrum, a small handful of expertly designed games have managed to successfully incorporate random features into to an otherwise strategic oeuvre (Le Havre comes immediately to mind), but, in such cases the impact of randomization is little more than precluding scripted choices; the random elements influence small, perhaps even important, tactical sequences within a strategic path, but never define the path itself. Key Market defies both approaches. By randomizing core elements in the set-up process, but leaving the subsequent game very nearly free of hidden information, the game manages to have it's cake (strategic gameplay) and eat it too (substantial replay value). In Practice. Take fields, for example. At the beginning of the game each player is randomly handed one of eight possible field boards (shown in the picture below). In turn order, players orient and then place their field board adjacent to any of the fields already placed. Players then place one of their workers on the board they placed. There are a few small placement restrictions, but the range of legal board orientations large. The players' decisions at this stage have critical consequences for how the remainder of the game will unfold. Each field board is composed of eight fields and a center village (the purple circle). Each field produces a single type of crop. The shape of the field (circle or square) denotes the number of crops typically produced. Here's the key: any number of orthogonally adjacent fields of the same type create a single area, and each are can hold only one worker at a time. One. Singular. Period. Not one from each family. Not one for each board that the area covers. Not "usually one, but you can pay more for extra." There's a cheat sheet for deciphering this image somewhere in the rulebook. I won't reproduce here, but suffice it to say that what you see above is an assload of Xs. As players hire workers throughout the game and attempt to move them around the communal field boards to optimize production, the available legal placements become quite small, requiring expensive synchronous movement (oh yeah, Mr. Moneybags, you pay just to move). Moreover, each productive season -- Spring, Summer, and Fall -- certain fields will produce in abundance while others dry up. 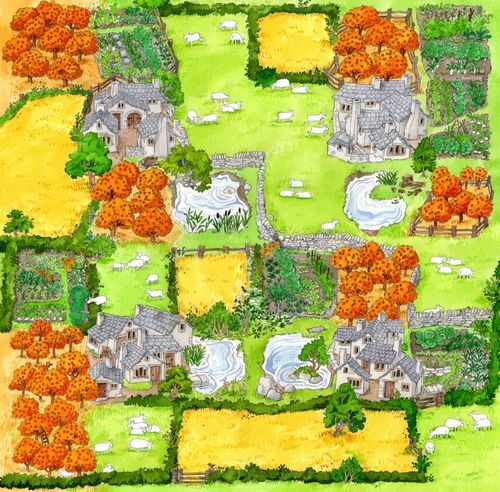 The markers that determine which crops are thriving in each season are semi-randomly distributed at the start of each game, and are foreseeable several seasons in advance. They are also open information at the time of the initial board placement. Analysis. 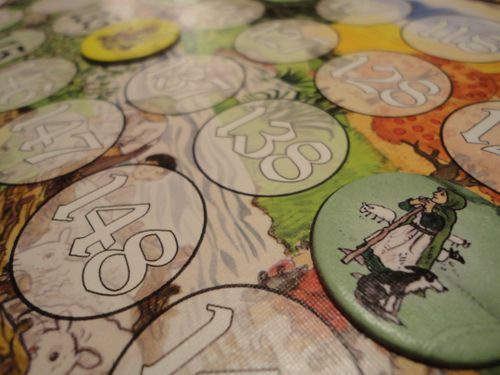 The players' choices in this initial field and worker placement step lays the groundwork for the strategic decisions to come throughout the game. The size and shape of areas, the scarcity of particular resources, and the relative positions of players are palpable strategic constraints actively built into the game by the players in response to random elements. It’s a beautiful system. The feeling evoked by Key Market's field and worker system is akin to those produced by randomization in highly tactical games, that of making do with what you're given (MacGyver, ftw!). So why do I insist that, unlike those games, Key Market's randomization provides constraints at the strategic, rather than tactical, level? For one, an entire game of Key Market spans a mere six productive seasons. The consequences of the constraints imposed by each new game's field placements are therefore eminently predictable; a reasonably experienced Key Market player can have a strong sense of how crop production might unfold before the game even begins. Second, various other game elements inform a player's production goals. The cost and likelihood of attaining those production goals, which will dictate the importance of those different game elements to each player's approach to the game, are themselves dictated by the structure of the fields. And, again, this information is at least peripherally apparent before the first crop is harvested. Hence, strategy! 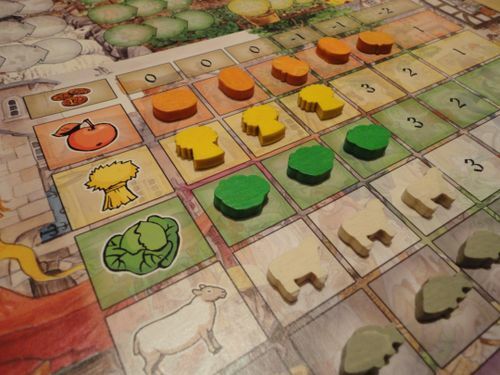 Of course, Loyang and Key Market have very little in common superficially, beyond perhaps the soothing, cartoonish artwork and adorable vegimeeples. 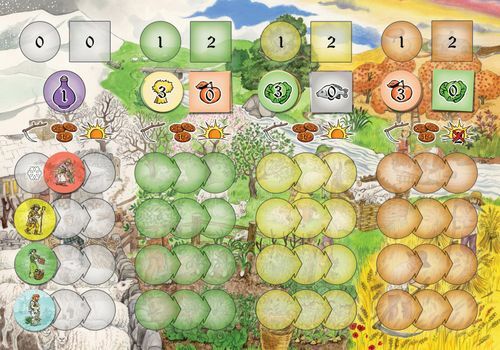 Loyang is a over-long, under-produced, and solitaire-ish game most known for its Antiquity-inspired harvest mechanic. Key Market is a challenging, heavily interactive game of turn order management, special power combo-building, and opportunism. Yeah. In Practice: You see, the heart of Key Market’s gameplay is carefully balancing the need for hard assets (vegimeeples) against the need for cash in hand. 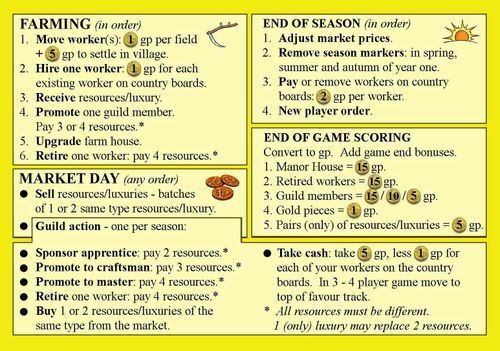 Cash (GP) is needed to pay for your workers who harvest from the fields (it is also the game’s victory points, in case that wouldn’t have been obvious from the simple fact that the game is about managing a market economy). Having workers in the fields is the only way to get resources., and having resources is the only way to get cash to pay your workers. Yeah, have fun with that one. Cash is acquired principally through selling resources on market day. 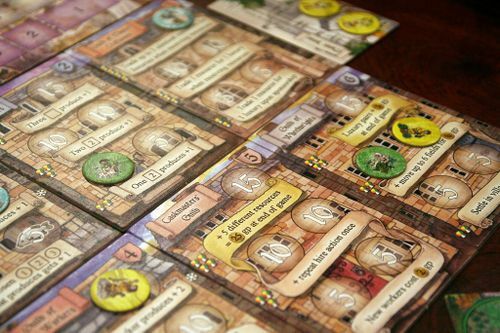 Each turn, players secretly select and then simultaneously reveal the resources they will bring to market. Resources must be sold in small batches, requiring players to anticipate and react to the choices of their opponents. Key Market is a game played on the margins, however, and the opponent-induced market shifts can be disastrous to your plans if you’re cutting things too close. Of course, as you’ll soon see, over-liquidating resources can also be disastrous. I don’t want to derail the discussion, but I will briefly note that Key Market’s implementation of a market is the best I’ve encountered. Although resource value isn’t as dynamic as, say, Power Grid, small changes in value are much more impactful. Importantly, the game provides truly meaningful opportunities to establish a market-based strategy, using well-timed purchases to exploit future resource monopolies. The thing that makes market sales so tricky is that resources (in their hard form) may also be directly converted into end-game GP through several mechanisms, and the resource costs for these conversions cannot be supplemented with cash. In other words, the game incentivizes the continued depletion of present assets with the promise of eventual victory, and thus produces self-inflicted cash-flow problems for players. In practice, this aspect of the design is strikingly similar to Loyang’s turn-end victory-point investment, which invites players to convert cash on hand into victory points with favorable exchange rates at the risk of leaving players underfunded for the next round’s operations. The cleanest example of this design feature at work in Key Market is worker retirement. Twice per turn a player has the opportunity to retire one of his or her workers at a cost of four different resources. The retired worker is permanently removed from the game, but is worth 15 GP at the end of the game. 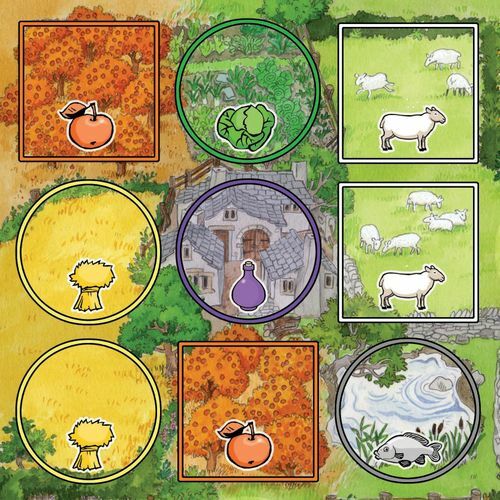 In addition to functioning to drain assets from the game, as discussed above, the requirement of four different resources usually requires players to incur one of two types of inefficiencies: Diversifying crops through the placement of workers in the fields can produce multiple resources per turn, but (because of the production season cycles) typically produces fewer resources than would have been possible. Maximizing resource production each turn usually means insufficient diversity, requiring players to carry over resources from round to round (and if you’re assests aren’t working for you…). Navigating these inefficiencies -- surfing the crests of production seasons while maintaining diversity and controlling the market -- is an integral element of gameplay (and one of the reasons that the game is often so damn hard). The other notable example of direct asset-to-victory point conversion is guild membership. Initial sponsorship of a worker into one of the several randomly selected guilds (yet another source of a strategic element randomized at setup) costs two different resources and provides 5 GP at the end of the game -- a measly 2.5 GP per resource compared to retirement’s 3.5. Each guild position, however, also provides some special power benefit (it’s good to have friends in high places). Although the low-level guild powers are usually weak, players can climb the ranks within each guild, gaining new or additional powers (and another 5 end-game GP) at escalating costs: three different resources for craftsman level; four to become a master. What’s that you say? Guilds are simply costly Helper cards that you can – gasp! – actually plan for? Well, gee, you might have a point there. Rant: I’m almost certainly underselling the strategic importance of guild powers to Key Market. I’m not a special-power combo-builder. If you adore games like Dominion, where the essential strategy is hunting for synergies among the benefits provided by the randomly selected Kingdom cards, Key Market’s guilds will be your bread and butter. There are other threads that do fantastic jobs of discussing this aspect of the game. One key point that I hope to get across, however, is that Key Market is so much more than another derivative combo-building game! In fact, I rarely have workers advance beyond the apprentice level of any guild (I question whether the opportunity costs will be worth it.). There is no doubt that the guilds are the game’s primary source of interplay variety -- and therefore the primary drivers of player strategy -- but I think that exploiting the benefits of guild membership is merely one small source of points-generation in a game with many, many interdependent moving parts. Analysis: So, what’s the uptake? Key Market is unquestionably an optimization game. At the most superficial level that means understanding and appreciating opportunity costs. But that would be too easy. The game’s optimization tensions are not simply about reading a board state, but about managing the form of assets to facilitate timely reinvestment – whether through guilds or paying workers -- and to then manage the flow of assets – whether achieving the diversity required for worker retirement or monopolizing a resource for a massive market sell-off. Although unquestionably more challenging, many of Key Market’s central tensions are also undoubtedly familiar, evoking the spirit, if not the form, of Rosenberg’s Loyang. If you’re a fan of At the Gates of Loyang (or even if you simply thought it failed to utilize its own good ideas), and you are looking for a greater challenge, heavier decisions, a shorter time and a heavy dose of player interaction that is more “watch this” than “take that,” Key Market should be on your radar. My initial instinct in playing Loyang was to squish the player boards together and share market stalls and shop resources just to make things a little more…interesting. It turns out David Brain designed the Loyang I would have designed, but better. Much better. This is Loyang on steroids (and if someone had said that before Essen…oh, yeah, it sold out anyway. Old habits, you know?). 1. "Hmmm...I have 3 wheat, a sheep, and a cabbage. But Jenn also has 3 wheat, and she goes first. I don't think she has cabbage, and cabbage is worth a lot. I should take my cabbage to market." 2. "Crap, I need to take a guild action and now I only have wheat and sheep. I should have thought this through. I guess I could add a new apprentice. That seems reasonable." 1. "Crap. I only made 4 money off of my cabbage. I can't afford to pay all 3 workers. I guess I have to lose one." 1. "Crap, I didn't save any money to move or hire a worker. And the wheat circle isn't producing anything. I guess I get another sheep." 2. "Crap. I only have wheat and sheep. I can't promote or retire anyone." 1. "Crap, Jenn really deflated the market value of wheat last turn, but I really need money. I guess I'll take all my wheat to market and save the sheep just in case." 2. "Crap, I need to take a guild action and I only have a sheep. I guess I'll take 3 GP." 1. "Crap, I got all this money, but next season is the winter. I guess I'll only keep one worker." 2. "Crap, Jenn's keeping one worker too. She gets to be first again." 1. "Crap. Jenn just hired a worker and moved it into the only free village. Stupid turn order." 2. "Crap, I don't produce anything." 3. "Crap, I only have sheep. I can't promote or retire anyone." 1. "I guess I have to take a sheep to market." 2. "Crap, I have to take a guild action and have no resources. Maybe I should buy wheat while it's cheap, so I can sell them for a lot when they produce 3 next turn." 1. "Crap, I guess I'll pay for this stupid guy again, so I can get six wheat next turn." In case you didn't pick up on all the "craps" in there, it wasn’t exactly the most enjoyable experience. One of my initial issues was that I tried to approach Key Market by optimizing each action within a turn. But rather than this optimization producing additional resources and thus expanding future options, as in, say, Vasco da Gama, optimizing each Key Market action purely in terms of money ends up restricting future options because of the asset liquidity issues, producing net inefficiencies. Ad hoc decisions undoubtedly have ripples that you’re not seeing, and are therefore not controlling. Taking a longer-term view of the game largely means recognizing when sub-optimal actions this turn nevertheless produce a more desirable game state for the future. It took me about 5 plays (and a lot of thought even when not playing), but I’m now at the point where I'm making a move because I know it is part of what I want to do three seasons from now, not simply because it seems like the best I can do with what I've got at the moment. I think the design is genius because it holds the potential for truly strategic play, not merely tactical optimization. But it’s also a game that requires it. 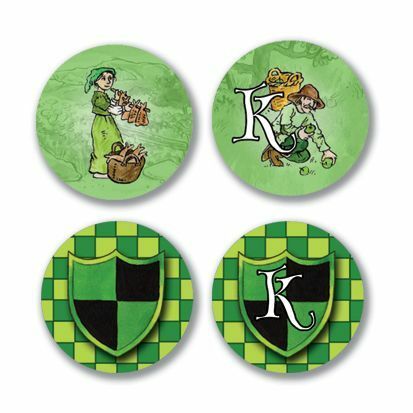 Key Market is a game in which unfocused play feels a lot like spinning your wheels -- a game in which you have two apples and a cabbage and then you move, hire, produce, sell, buy, pay, move, hire, produce, promote, and then you look down and you still have two apples and a f***ing cabbage! Indeed, the game is so strategy-focused that the most enjoyable moment often comes at the end, when my opponent and I discuss which strategies we should have pursued in retrospect. (That may sound damning, but, trust me, those are very enjoyable moments). Yes, a lot of things need to come together to avoid frustration, but once you reach that level, you can understand the game's brilliance. I've gone from just wanting to understand the consequences of my actions to wanting to squeeze every ounce of efficiency from the game. I’ve gone from, “I have X resources, what can I do with them?” to, “I'd like to take a strong position in apples by the second spring, so I'll go worker heavy early, take apprentice positions in those two guilds, cash out, plant one guy in a village over fall and winter, flip the manor house in fall, sell a luxury to buy up the apple market in winter, and then sell, sell, sell.” I love the game because it makes me think extremely deliberately. The more I think about it, the more I feel like it could be a masterpiece. It usually exhausts me, but I find it rewarding to watch my plans succeed. It should be on my shelf for a long time. I'd previously not understood the desire to climb a mountain simply "Because it's there," but each play of Key Market left some stain in my mind that colored my thoughts and drove me toward conquest in a way that I'd not previously felt from a game. It initially exhausted me because it made me want to chase for an elite level of understanding that seemed to elude me. And the more I thought about the game, the more it was "there," a presence on the shelf. It kept coming to the table because I wanted to see its parts move; I wanted to push on the balloon and watch it ripple and expand. My wife calls it a game that is simply smarter than us, but I couldn't resign myself to acceptance in the way that she had. I needed to understand. Now I understand: Key Market can be nasty hard, but it's also wicked sweet. Postscript: This review was particularly challenging to write. Key Market is a tight game with many nuances. I could have replaced my entire review with an equally detailed discussion of any number of other elements: the cutthroat jockeying for turn order, the importance of scarce guild actions, and the race up the guild ranks. Indeed, those features are no less important (and are in some cases more so) than the ones I’ve identified. It’s just that kind of game. I hope that what I did provide was nevertheless useful in at least piquing your interest. ...each play of Key Market left some stain in my mind that colored my thoughts and drove me toward conquest in a way that I'd not previously felt from a game. I'm discovering that some games I had to fight with, and still do. By this I mean when I first sat down to play I couldn't see or understand them yet I kept thinking about them. Almost like a sort of seduction was taking place & I was the subject. And the game kept dropping veils. Navigating these games feels elusive while I'm playing, yet when I'm away from the table, in my mind, I feel I grasp it with certainty. Back & forth. The funny thing is I'm not necessarily very good at playing them, win or lose, or at least that's what I perceive. Maybe there's just something quixotic about this whole thing, but these are the best of games I think. And I cannot begin to figure out which one will do it to me or my shelves would be thinner. So yes, you sure as hell have piqued my interest. Yet another excellent review Ben. I'm always on the look-out for meaty 2-player titles that scale well. Congratulations Key Market; you're on my radar with a bullet, welcome. This was one of the most enjoyable reviews I've ever read on the Geek!! Being a big fan of the Agricola-theme, I'm sold on this one (especially since Agricola grew a little old and stale). This review could also double as a strategy article. It feels a little early to write a 'What You're Missing' review for this game, since many who pre-ordered will only be receiving the game now. My copy only arrived last week, so when I read the title of this review I thought "it's not my fault I've been missing it!" Wow...now that is a review! Thanks for the support, everyone. It looks like I picked the wrong day to publish a review; we've already been bumped to the middle of the second page. Great point, Rich. It didn't occur to me that my title might be perversely mocking those who are still eagerly awaiting the game. I swear it's just the name of the series! Apologies to anyone who felt slighted. I'm glad you brought up player count; I'm not sure that I played up this aspect enough in the review itself. Key Market works brilliantly with two, though I suspect that my favorite number will ultimately be three (it's my favorite number in most games). Interestingly, for a game that offers so many challenging decisions, it is also surprisingly spouse-friendly. Looking over your ratings, I could see this being a 7-8 for you and an 8 for your wife. Nice review. While I don't think this game is for me, I'm intrigued by the way it does things. I'll be looking into more of your reviews in the future. It does not appear that rule change is official. Good catch. I had not subscribed to that thread, and did not see Richard Breese's comment at the end saying that, as the publisher, he won't endorse the change. I'll have to change that from "official" to "designer-endorsed." It's a beneficial change, however, and I would recommend that everyone who plays the game use it. Yes, this is indeed the case. As Richard noted in his posting, this is more like a variant that has been proposed which players may or may not choose to adopt (just like any other variant.) Although many people do indeed read the Geek, it is clearly not an official conduit for rules changes for R&D Games - if they ever happen then it would only be as a result of a new edition of the game as Richard made clear. I’m almost certainly underselling the strategic importance of guild powers to Key Market. I’m not a special-power combo-builder. If you adore games like Dominion, where the essential strategy is hunting for synergies among the benefits provided by the randomly selected Kingdom cards, Key Market’s guilds will be your bread and butter. There are other threads that do fantastic jobs of discussing this aspect of the game. One key point that I hope to get across, however, is that Key Market is so much more than another derivative combo-building game! In fact, I rarely have workers advance beyond the apprentice level of any guild (I question whether the opportunity costs will be worth it.). There is no doubt that the guilds are the game’s primary source of interplay variety -- and therefore the primary drivers of player strategy -- but I think that exploiting the benefits of guild membership is merely one small source of points-generation in a game with many, many interdependent moving parts. Geekbuddied for this! I'll look to see what other games you recommend, as I feel the same way about "combo-building," it just doesn't interest me and I'm not into that aspect of for example Agricola and Glen More. So I'm glad that you point this out about Key Market, because I really enjoyed my one play so far and would like to play more, but if that part of the game is what it all boiled down in the end if you want the win, that would be a disappointment. 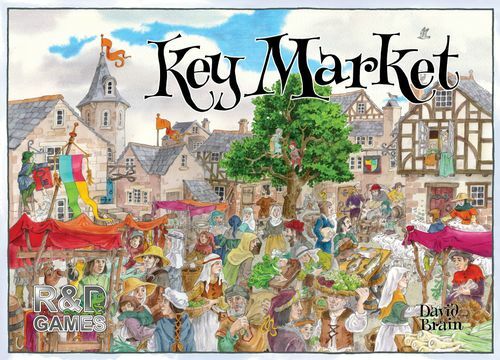 Key Market is a game in which unfocused play feels a lot like spinning your wheels -- a game in which you have two apples and a cabbage and then you move, hire, produce, sell, buy, pay, move, hire, produce, promote, and then you look down and you still have two apples and a f***ing cabbage! I'm sorry, but which non-official rule change are you guys referring to? That the Key Worker may not move into a village. I want to make it clear that I am in total agreement with Richard on this matter - nothing posted on BGG can ever be "official", only the game is "official" and both of us are happy with the published game as it stands. Perhaps it would be better to consider this as a "variant" rather than a "rule change", since that represents its status more accurately. David - I have edited my post to just point to the thread in question. Apologies for the errors in the previous draft. Consider my interest piqued. Fine review. Thank you. I hope you find an opportunity to try it. It's substantially more complex than any of the games you've rated, but it's a great, deep game. I've actually raised my own rating of it recently after several really terrific two-player sessions. Enjoyable review really.Pity it is out of print.I would like to give this a try.We did not enjoy Keyflower(the only other game from the series that i tried) though and traded it after a couple of game plays.